I soon became interested in both sides. Playing the violoncello brought me into numerous chamber and church music ensembles, and stimulated my interest in musical composition that I tried extensively while in high school. At the age of 13, I found in the attic a case filled with chemicals, remainders of an uncle who died in 1923 and was, as a metallurgical engineer, interested in chemistry and photography. I became almost immediately fascinated by the possibilities of trying out all conceivable reactions with them, some leading to explosions, others to unbearable poisoning of the air in our house, frightening my parents. However, I survived and started to read all chemistry books that I could get a hand on, first some 19th century books from our home library that did not provide much reliable information, and then I emptied the rather extensive city library. Soon, I knew that I would become a chemist, rather than a composer. I wanted to understand the secrets behind my chemical experiments and behind the processes in nature. Thus, after finishing high school, I started with high expectations and enthusiasm to study chemistry at the famous Swiss Federal Institute of Technology in Zurich (ETH-Z). I was rapidly disappointed by the state of chemistry in the early fifties as it was taught at ETH-Z; we students had to memorize incountable facts that even the professors did not understand. A good memory not impeccable logic was on demand. The physical chemistry lectures did not reveal much insight either, they were limited just to classical thermodynamics. Thus, I had to continue, similar as in high school, to gain some decent chemical knowledge by reading. A book from which I learned a lot at that time was “Theoretical Chemistry” by S. Glasstone. It revealed to me the fundamentals of quantum mechanics, spectroscopy, statistical mechanics, and statistical thermodynamics, subjects that were never even mentioned in lectures, except in a voluntary and very excellent lecture course given by the young enthusiastic Professor Hans H. Günthard who had studied chemistry and physics in parallel. It was clear to me, after my diploma as a “Diplomierter Ingenieur Chemiker” and some extensive military service, I had to start a PhD thesis in the laboratory of Professor Günthard. Fortunately, he accepted me and associated me with a young most brilliant scientist Hans Primas, who never went through any formal studies but nevertheless acquired rapidly whatever he needed for his work that was then concerned with high resolution nuclear magnetic resonance (NMR), a field in its infancy at that time. Much of his and also my time was spent on designing and building advanced electronic equipment for improved NMR spectrometers. In parallel, we developed the theoretical background for the experiments we had in mind as well as for the optimum performance of the instruments. Signal-to-noise ratio calculations and optimizations were daily routine as NMR suffers from a disappointingly low sensitivity that severely limits its applications. 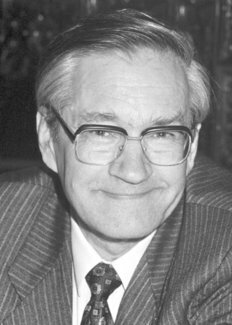 Hans Primas developed and analyzed field modulation techniques, constructed a field frequency lock system, and contributed a new design of shaped pole caps for the electromagnet that was supposed to deliver an extremely homogeneous magnetic field. These developments led to two types of spectrometers that were adopted by Trüb-Täuber, a Swiss electronics company, and sold all over Europe. Later in 1965, Trüb-Täuber was dissolved, and the NMR spectroscopy section led to the foundation of Spectrospin AG that is, together with Bruker Analytische Messtechnik, nowadays the world leading producer of NMR spectrometers. My own work dealt with the construction of high sensitivity radio frequency preamplifiers and in particular high sensitivity probe assemblies, initially for a 25 MHz, later for a 75 MHz proton resonance spectrometer. On the theoretical side, I was concerned with stochastic resonance. The goal set by Hans Primas was the usage of random noise for the excitation of nuclear magnetic resonance, following the famous concepts of Norbert Wiener for the stochastic testing of non-linear systems. The theoretical treatment was based on a Volterra functional expansion using orthogonal stochastic polynomials. I tried in particular to design a scheme of homonuclear broadband decoupling to simplify proton resonance spectra. By applying a stochastic sequence with a shaped power spectral density that has a hole at the observation frequency, all extraneous protons should be decoupled without perturbing the observed proton spin. The theoretical difficulties were mainly concerned with the computation of the response to nonwhite noise. Experiments were not attempted at that time, we did not believe in the usefulness of the concept anyway, and I finished my thesis in 1962 with a feeling like an artist balancing on a high rope without any interested spectators. I thus decided to leave the university forever and tried to find an industrial job in the United States. Among numerous offers, I decided for Varian Associates in Palo Alto where famous scientists, like Weston A. Anderson, Ray Freeman, Jim Hyde, Martin Packard, and Harry Weaver, were working along similar lines as we in Zürich but with a clear commercial goal in mind. This attracted my interest, hoping to find some motivation for my own work. And indeed, I was extremely lucky. Weston Anderson was on his way to invent Fourier transform spectroscopy in order to improve the sensitivity of NMR by parallel data acquisition. After his involvement in the development of a cute mechanical device, the “wheel of fortune”, to generate and detect several frequencies in parallel, he proposed to me in 1964 to try a pulse excitation experiment that indeed led to Fourier transform (FT) NMR as we know it today. The first successful experiments were done in summer 1964 while Weston Anderson was abroad on an extensive business trip. In this work I could take advantage in an optimum way of my knowledge in system theory gained during my studies with Primas and Günthard. The response to our invention was however meager. The paper that described our achievements was rejected twice by the Journal of Chemical Physics to be finally accepted and published in the Review of Scientific Instruments. Varian also resisted to build a spectrometer that incorporated the novel Fourier transform concept. It took many years before in the competitive company Bruker Analytische Messtechnik Tony Keller and his coworkers demonstrated in 1969 for the first time a commercial FT NMR spectrometer to the great amazement of Varian that had the patent rights on the invention. Still at Varian, I was further extending my earlier work on stochastic resonance with the introduction of heteronuclear broadband decoupling by noise irradiation, the “noise decoupling” that led to a rapid development in carbon-13 spectroscopy. It has been replaced later by the much more efficient multiple pulse schemes of Malcolm H. Levitt and Ray Freeman using composite pulses. Of major importance for the success of more advanced experiments and measurement techniques in NMR was the availability of small laboratory computers that could be hooked up directly to the spectrometer. During my last years at Varian (1966-68), we developed numerous computer applications in spectroscopy for automated experiments and improved data processing. In 1968 I returned, after an extensive trip through Asia, to Switzerland. A brief visit to Nepal started my insatiable love for Asian art. My main interest is directed towards Tibetan scroll paintings, the so-called thangkas, a unique and most exciting form of religious art with its own strict rules and nevertheless incorporating an incredible exuberance of creativity. Back in Switzerland, I had a chance to take over the lead of the NMR research group at the Laboratorium für Physikalische Chemie of ETH-Z after Professor Primas turned his interests more towards theoretical chemistry. Despite an initial lack of suitable instrumentation, I continued to work on methodological improvements of time-domain NMR with repetitive pulse experiments and Fourier double resonance. In addition, we performed the first pulsed time-domain chemically-induced dynamic nuclear polarization (CIDNP) experiments. We developed at that time also stochastic resonance as an alternative to pulse FT spectroscopy employing binary pseudo-random noise sequences for broadband excitation, correlating input and output noise. Similar work was done simultaneously by Prof. Reinhold Kaiser at the University of New Brunswick. The next fortunate event occurred in 1971 when my first graduate student, Thomas Baumann, visited the Ampere Summer School in Basko Polje, Yugoslavia, where Professor Jean Jeener proposed a simple two-pulse sequence that produces, after two-dimensional Fourier transformation, a two-dimensional (2D) spectrum. In the course of time, we recognized the importance and universality of his proposal. In my group, Enrico Bartholdi performed at first some analytical calculations to explore the features of 2D experiments. Finally in the summer of 1974, we tried our first experiments in desperate need of results to be presented at the VIth International Conference on Magnetic Resonance in Biological Systems, Kandersteg, 1974. At the same time, it occurred to me that the 2D spectroscopy principle could also be applied to NMR imaging, previously proposed by Paul Lauterbur. This led then to the invention of Fourier imaging on which the at present most frequently used spin-warp imaging technique relies. First experiments were done by Anil Kumar and Dieter Welti. From then on, the development of multi-dimensional spectroscopy went very fast, inside and outside of our research group. Prof. John S. Waugh extended it for applications to solid state resonance, and the research group of Prof. Ray Freeman, particularly Geoffrey Bodenhausen, contributed some of the first heteronuclear experiments. We started 1976 an intense collaboration, lasting for 10 years, with Professor Kurt Wüthrich of ETH-Z to develop applications of 2D spectroscopy in molecular biology. He and his research group have been responsible for most essential innovations that enabled the determination of the three-dimensional structure of biomolecules in solution. During the following years, a large number of ingenious coworkers, in particular Geoffrey Bodenhausen, Lukas Braunschweiler, Christian Griesinger, Anil Kumar, Malcolm H. Levitt, Slobodan Macura, Luciano Müller, Ole W. Sørensen, and Alexander Wokaun, contributed numerous modifications of the basic 2D spectroscopy concept, such as relay-type coherence transfer, multiple quantum filtering, multiple quantum spectroscopy, total correlation spectroscopy, exclusive correlation spectroscopy, accordion spectroscopy, spy experiments, three-dimensional spectroscopy, and many more. In parallel, numerous other research groups contributed an even larger number of innovative methods. Besides these activities in high resolution NMR, we always had a research program in solid state NMR going aiming at methodological developments, such as improved 2D spectroscopy techniques and spin diffusion, and applications to particular systems such as one-dimensional organic conductors, polymer blends, and dynamics in hydrogen-bonded carboxylic acids in collaboration with Thomas Baumann, Pablo Caravatti, Federico Graf, Max Linder, Beat H. Meier, Rolf Meyer, Thierry Schaffhauser, Armin Stöckli, and Dieter Suter. More recently, I had also the pleasure to closely collaborate with Prof. Arthur Schweiger, an extremely innovative EPR spectroscopist, in the development of pulsed EPR and ENDOR techniques. This turned out to be a specially challenging field due to the inherent experimental difficulties and the many ways to overcome the problems. In recent years, more and more of my time has become absorbed by administrative work for the research council of ETH-Z of which I am presently the president. I recognized that teaching and research institutions vitally depend on the involvement of active scientists also in management functions. Looking back, I realize that I have been favored extraordinarily by external circumstances, the proper place at the proper time in terms of my PhD thesis, my first employment in the USA, hearing about Jean Jeener’s idea, and in particular having had incredibly brilliant coworkers. At last, I am extremely grateful for the encouragement and for the occasional readjustment of my standards of value by my wife Magdalena who stayed with me so far for more than 28 years despite all the problems of being married to a selfish work-addict with an unpredictable temper. Magdalena has, without much input from my side, educated our three children: Anna Magdalena (kindergarten teacher), Katharina Elisabeth (elementary school teacher), and Hans-Martin Walter (still in high school). I am not surprised that they show no intention to follow in my footsteps, although if I had a second chance myself, I would certainly try to repeat my present career.